Looking last week at the secrets of Warren Buffett’s success, one mystery remains: the winning formula for Warren Buffett’s equity selection. 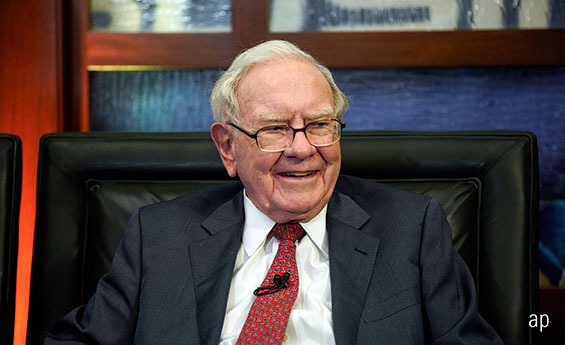 The Oracle of Omaha is known to play it safe: Berkshire Hathaway’s (BRK.A) companies have been of high quality, consistently profitable, with high cash flows and low debt. Consequently, their stock prices have been relatively stable. That doesn’t square with posting record gains during a prolonged bull market. Assuming more risk does not necessarily lead to higher returns, particularly during sell-offs, but it certainly should apply when stocks perform well over the very long haul, as they have during Buffett’s tenure at Berkshire. With Buffett’s equity portfolio, the usual rules of risk and return have been inverted. Berkshire Hathaway dramatically contradicts the Nobel Prize-winning Capital Asset Pricing Model (CAPM) from William Sharpe. The CAPM states that the sole item that determines a stock’s long-term returns is its market sensitivity, or beta. The Buffett’s Alpha authors measure Berkshire’s historic beta at 0.69, as opposed to a marketplace average of 1.0, meaning that according to the CAPM, Berkshire Hathaway should have trailed the S&P 500 during Buffett’s reign. It assuredly has not. Berkshire also presents difficulties for a recent rival model to the CAPM, the Popularity Asset Pricing Model (PAPM). Unlike the CAPM, the PAPM assumes that equity prices are established for many reasons. Any attribute that makes a stock “more popular” makes that security more desirable, which reduces its future expected returns. In exchange for receiving those pleasant features, investors in stocks that have attractive attributes settle for lesser future gains. They are “willing losers”. This concept would seem not to work with Berkshire Hathaway. What could possibly be unappealing about holding low-debt companies that are reliably profitable, and whose stocks tend to resist downturns? With Berkshire, the CAPM and PAPM share in their confusion. The CAPM disapproves of Berkshire’s low beta, while the PAPM warns that the gentleness of Berkshire’s holdings will slow its returns. The traditional response to such an argument is that Buffett is the exception to the rule. In the hands of others, such a tame portfolio would not shine. As the Buffett’s Alpha paper demonstrates, though, this claim is incorrect. The authors created a mechanical investment strategy that emulated Buffett’s taste for low-beta, high-quality companies, without incorporating any additional insight. Before trading costs, that portfolio has outgained Berkshire’s holdings, since 1976. How could that be? How could such a simple, safe investment approach prove so successful? This is where modern finance falters. It has become adept at diagnostics. In the early days of the efficient markets hypothesis – which states the market has already discount publicly available information – aberrations received insufficient attention. The thesis is broadly correct, but the financial markets contain many strange corners. Today’s researchers have located many of those oddities. They know the whats, but not so much the whys and hows. One potential explanation for why the tortoises have beaten the hares has been provided by the Buffett’s Alpha authors, albeit in a different context: low-volatility stocks have benefited from a common investment constraint. The CAPM assumes that investors will conclude that they should own the overall market portfolio, combining with cash if they wish to reduce risk, and leveraging if they wish to increase it. That describes today’s real world in two instances out of three. Indexing has become prevalent, and cash always has been, but few investors, big or small, use leverage. Thus, if investors are to “beat the market,” they do so not by owning more equities, but instead by owning the better performers – which are typically believed to be riskier securities. The upshot: stock buyers have crowded into the market’s most speculative segment. This hypothesis assumes that the market is in equilibrium; that is, the past will inform the future. Low-beta, stable companies have been forced to offer relatively high stock-market returns because of leverage constraints, and since these constraints continue to exist, that condition will likely persist. Baskets of such stocks will be labelled as “smart beta” – or strategic beta, as Morningstar’s terminology would have it. This is how investment funds are created. The second explanation is the opposite of the first. It maintains that the stock market’s equilibrium has been disturbed. When Buffett took charge of Berkshire Hathaway, 50 years ago, the merits of profitable, low-volatility companies were underappreciated. They were regarded as useful for downturns, but long-term laggards. Over time, though, those firms have been re-evaluated. Equity shareholders now realise that seemingly dull businesses can be anything but. As a result, Buffett’s stock type is no longer overlooked. Indeed, Berkshire’s outsize gains, and those of the robo-Buffett portfolio, owe in part to investors’ recalculations. They have bid up the prices of steady, blue-chip firms, thereby boosting the past gains of those stocks – but shrinking their future returns, so that they will indeed trail the overall stock market, as predicted by the academics. By such an argument can the PAPM – and CAPM – be defended. One set of observations, but two diverging conclusions. The first interpretation urges investors to be like Buffett, while the second cautions them to behave otherwise, because what was is not what will be. It is difficult to know which belief is correct. Modern finance is better at identifying so-called anomalies than it is at comprehending their causes – an insight that is required if we are to understand what to do with our discoveries.